So when I started this experiment I really wasn't sure where it was going to go. For some strange reason I decided to try making ice cubes out of vegetable oil figuring I could then add them to water. Easier said then done. Despite them being slippery they would NOT come out of my ice cube tray! I had to melt the edges a bit to get them out. So then I just refroze them in a big mass. I decided then I would add regular ice cubes and melt them by adding water. We tried cold water and hot water. Obviously they all melted faster in the hot water. I was surprised the oil didn't melt faster then the regular cubes, but it may have something to do with them being a large mass of frozen oil. After that the girls wanted to dump it all together, so we dumped both trays into a larger container and watched it separate. This amazed Bria! She kept asking, "What happened?" I tried to explain to her that the oil was floating on the water because it was not as dense.. So then we tried corn syrup. It sunk to the bottom. Then we added dish soap. It got hung up a little in the oil, but it ended right on top of the corn syrup. At this point the girls wanted to shake the whole thing up. 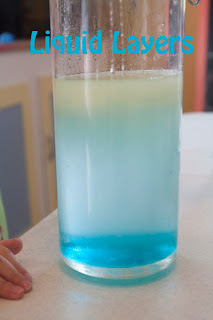 We did an ended up with a lovely blue colored solution (as the dish soap suspended the oil in the water) and lots of bubbles. The girls really enjoyed playing with the bubbles. At least until they knocked the whole thing over!